Tyrannosaurus Rex (T-Rex) was one of the largest predatory dinosaurs that ever existed. Living during the Cretaceous period (68-66 Mya) in the forested river valleys of today’s western North America, Tyrannosaurus is a carnivore popularly known for its large 5’ | 1.5 m skull, ferocious serrated teeth, small useless arms, strong tail, and powerful bipedal legs. 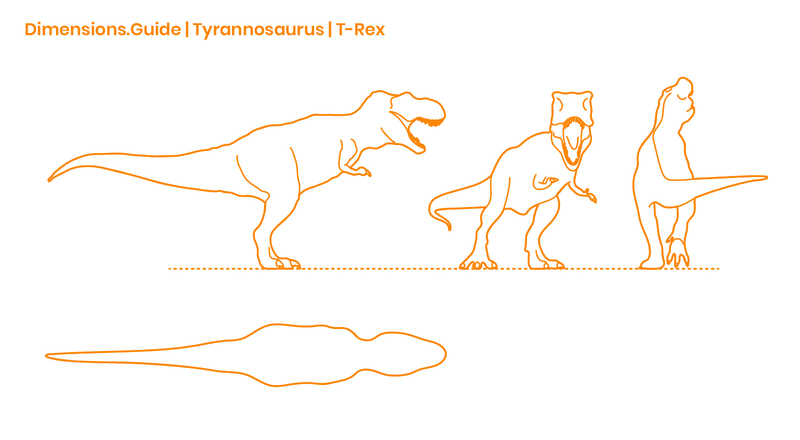 Tyrannosaurus Rex was 40’ | 12.3 m in length, with a head height of 17’ | 5.2 m and hip height of 12’-13’ | 3.7-4 m.